Debt burden: Can African gov’ts achieve efficiency gains through prudent management of vehicles? Africa’s debt burden is on the rise, yet a huge chunk of borrowed resources is lost to huge recurrent expenditure and lesser to capital investment. The dominance of recurrent expenditure in respective national budgets has also escalated through opulence behavior of government officials that are habitually purchasing unnecessary high caliber fuel guzzling and high end general maintenance costs. This tends to disregard, the otherwise expected value for money direct service delivery outputs and outcomes to the intended recipients of borrowed resources. Across Africa Including Uganda UDN takes cognizance of the Uganda Public Service Standing Orders (2010 Edition) that provide guidelines on the Acquisition, Usage, Care, Maintenance and Boarding-off of Government Fleet (Vehicles and Motorcycles) across the Ministries, Departments, Agencies and Local Governments (MDALGs). We, nonetheless, notice that in some instances the Public Service Standing Orders are often disregarded by some of the Government officials who are obligated to be good stewards of government Vehicles and Motorcycles on behalf of the rest of the citizens of Uganda. Yes Government officials need comfortable Vehicles and Motorcycles to execute their official work across Uganda and is in line with government policy but in in light of the global economic crisis running without essential drugs, schools are lacking essential teaching and learning materials, some roads are impassable and civil servants continue grumbling because of meagre salaries, there is a renewed public awareness and discontent over excessive government spending. 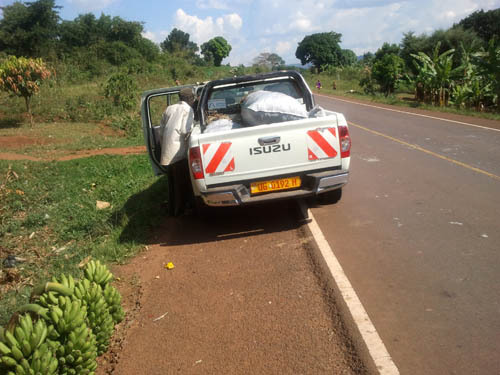 Contrary to The Uganda Public Service Standing Orders (2010 Edition), it is common to find Government Vehicles and Motorcycles laden with unauthorized items such as charcoal, matooke, firewood, pigs, beer; as well as engaged in private transportation for private gain, weddings, private farms and other such equipment. Such Fleet may suffer neglect, unwarranted wear and tear coupled with ever escalating costs of lubricants, repairs, fuel consumption and usage that are borne by the citizen through more taxation and/ or public borrowing, thus escalating Uganda’s debt situation. The government vehicles drivers also risk being abused by their superiors alongside the fleet, on activities that are not directly related to job descriptions, or regarded as due public service delivery and accountability. Additionally, the said Public Service Standing Orders stipulate that all Government vehicles should be parked and secured after working hours i.e. 8.00 am to 5.00 pm, or otherwise with explicit written authorization from a rightful Accounting Officer, if officially outside working hours and/ or weekends. Yet some government Vehicles like ambulances have been found outside the said designation which tantamount to misuse and abuse the said vehicles, even when they may be required to be at their due stations or on official work. Because of big fleet that requires maintenance, Government has to part with so much to maintain the current Government fleet. MOH for instance had a Fleet of over 350 Vehicles and Motorcycles, including 259 vehicles deployed at the MOH headquarters alone by beginning of FY 2017/18. In his annual report, December 2017 the Auditor General noted that the maintenance costs of RDC Motor Vehicles were on the increase while the Budget Framework Paper (FY 2017/18) showed that Government planned to spend Shs 95 billion on buying vehicles and other transport equipment. While this cost may be justified, we believe it would greatly reduce with more prudent use and handling of such vehicles, as well as reduction in the number of Government vehicles. In this case, such funds would be re-directed to other key areas, especially in the health and education sectors to improve service delivery outcomes. Government officials are flouting the Public Service standing orders on the use of public vehicles, with impunity, resulting into the loss of billions of taxpayers’ money. According the Public Service standing order, the Prime Minister is expected to have a vehicle with an engine capacity of 3500cc, Cabinet Ministers, Ministers of State and Permanent Secretaries are supposed to drive 2800cc vehicles. Meanwhile, the Directors and Senior Consultants are supposed to have executive mid-range station wagons of 2500cc. The lower ranks are supposed to have double cabin pick-ups of 2500cc. Even with an improved road network across Uganda, the Acquisition standards have over the years been eroded. With such practice there is a risk of inculcating a contrary culture where some Ministers and Permanent Secretaries today drive 4500cc Toyota Land Cruiser VX and other brands and a similar situation that plays further with other ranks, contrary to standards and ethical Code of Conduct for public service. Case of Rwanda: In December 2004, realizing a high cost of Government Fleet, Rwanda sold off all 4WD vehicles with a capacity of over 2000cc. It impounded 250 vehicles in total leaving Government institutions with less than 10 vehicles each. In case of need for additional motor vehicles, the Government of Rwanda identifies travel agencies to hire out their vehicles with drivers, to a Government institution or activity. The travel agencies maintain these vehicles. Only five Government officials are entitled to a Government vehicle “the President, Prime Minister, Speaker of Parliament, Senate Speaker and the Head of the Supreme Court- of which all vehicles must be under 2000cc. Any other high ranking Government official is through a facility supported for purchase of a vehicle; and through a scheme given a fixed allowance for maintenance, on a cascading scale of seniority. For any official up-country travel, Government will hire vehicles on a case-by-case basis. Case of Tanzania: Each government ministry has a specific number of Fleet it maintains. Their maintenance is Government responsibility with mechanics, engineers and drivers on government payroll, similar to what Uganda had as the Central Mechanical Workshop. In the event of need for additional vehicles, private transport companies are approached and the Ministry or institution concerned is invoiced for services provided. All government vehicles and motorcycles are parked at government office at 5.00 pm until 6.00 am the following day, or unless otherwise authorized in writing by a due officer. Reduce government Fleet (Vehicles and Motorcycles): Institute a considerable reduction of fleet, upon which to achieve an aggregate reduction around some of the unwarranted costs of the Fleet (Acquisition, Maintenance and Boarding-off). The reform would re-lease substantial funds to direct service delivery outcomes in Uganda. Institute Computerized Vehicle location and Fuel usage monitoring: obtaining capacity for Computerized Vehicle location and Fuel usage monitoring equipment. This can be piloted with a few Ministries and once successful, we should roll out the reform across MDALGs. We could also take learning from what Kampala City Council Authority has so far achieved on improved care of their Fleet monitoring and the Napak District Local Government on how to enforce the 8.00 am to 5.00 pm guideline, unless with explicit written authorization from a rightful Accounting Officer, if officially outside working hours and/ or week-ends. Learn from other countries and institutions: For the medium to long term-term, study opportunities under Vehicle co-ownership or even Leasing, with a view to bringing more care and reduced cost of Government Fleet. Rwanda and Tanzania are already examples from where Government can draw inspiration, towards more Prudent Acquisition, Management and Boarding-off Government fleet.